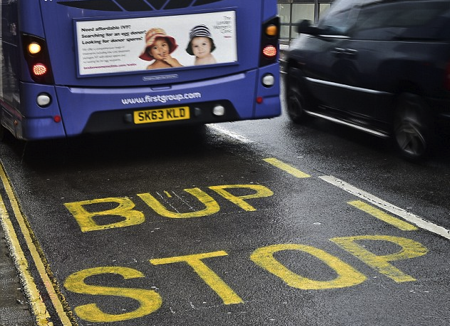 If you have ever wondered were the ‘BUP’ stops, then thanks to some very clever and incredibly intelligent signwriters in London I can show you! The Cat is one of the most successful feline authors in the history of Catkind. His sharp elegant wit has produced the bestselling book ‘Getting Out – Excerpts from a Cat’s Diary’ and of course the much plagiarised gag of the same name which appears on all of the funniest joke sites on the internet. 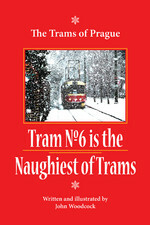 This heavily illustrated books created especially for iPads, Pods and Phones called Tram No 6 is the Naughtiest of Trams and it looks amazing. Don’t forget dear cuddly readers one and all that my translator’s heavily illustrated book has just been made available at the iBookstore or iTunes – what was it with Steve Jobs and all of the ‘i’s’? To get whizzed straight to the store whatever it’s called just click on the picture of the cover of that wonderful book below. 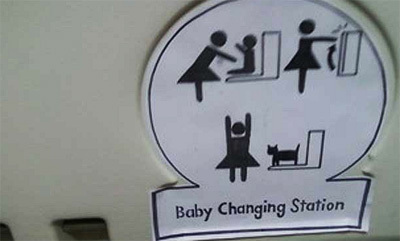 I like strange signs, but occasionally even I can’t work out what on earth they mean! Do they do what it says on the sign? As you know I love signs and I love to share my love of signs with my dear cuddly readers, here is one of my favourite signs. It is Italian and is a perfect demonstration of the way that not every sign translated into English becomes a monster of the English language, no that only happens when the Chinese translate signs. 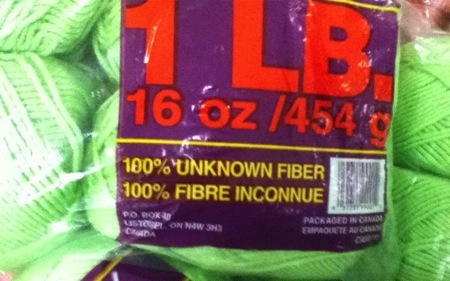 Speaking of signs, I heard of one just now, someone sent me a message about a sign they had just seen. The sign was apparently stuck to a large wheelie (trash) bin (under two pairs of spectacles) sadly my informant didn’t include a picture, but then the handwritten sign was in Czech so only a minute percentage of the population of the world would have understood it anyway, and of course I can’t be included in that tiny group. Still who can fault a nation of such honest people, if this was England the glasses would have either been stolen, or more likely smashed by some moron, just for the hell of it. The sad thing is that it is possible that the person who lost the glasses won’t actually be able to see the two pairs of glasses neatly balanced on the wheelie bin under the “lost glasses” sign because they might not have a spare pair of specs as it would seem that they have lost not only their main pair of glasses but their spare ones too. What a pity, obviously June 12th is not someone’s day, I do hope that it gets better and he or she finds his “lost glasses”. With the unexpected snow, that obviously doesn’t have its alarm clock set for ‘Winter,’ falling all over New York I though it was about time to look at silly road signs yet again and I promise you on my travels researching my latest book buster of a book ‘The Cat’s Travelogue’ I saw loads. 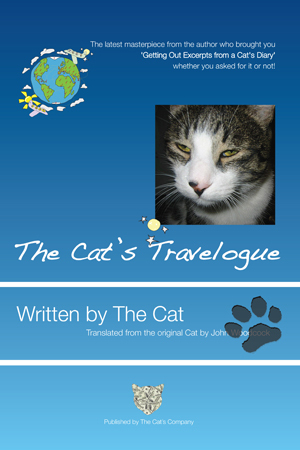 Oops I nearly forgot you can get a copy of my latest unputdownable book ‘The Cat’s Travelogue’ here The Cat’s Travelogue Paperback Edition or if you are more than a little wired the ebook here The Cat’s Travelogue ebook. It seems that people who erect ‘drive safely’ signs are causing havoc with innocent motorists and here is the very latest example. 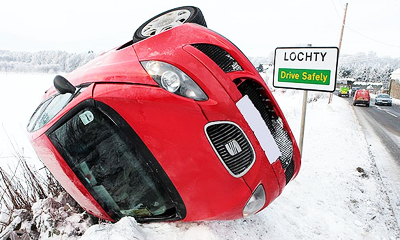 I bet the poor driver was too busy reading the sign in heavy snow to watch the road and a dangerous piece of ice that started this accident. 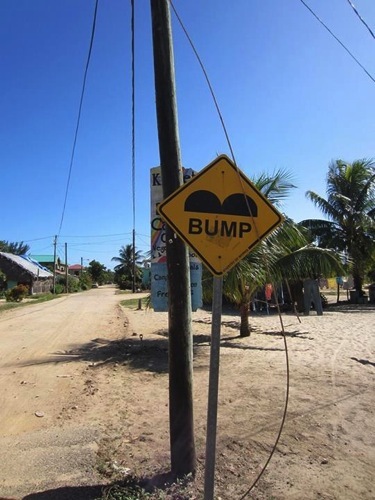 I do wish that people who are responsible for safety signs would be more responsible don’t you? Still I suppose the old saying is true, “where you get motorists you get accidents!”A saying that is also true if you replace the word ‘motorist’ with human in this Cat’s experience! I am so sorry I can’t resist the urge to show you the cover of my latest book! There it’s better to get these sorts of urges over and done with isn’t it? The thought processes of people who not only create signs but also leave them lying around to confuse others is unfathomable. It seems a shame to this intelligent and fabulously good looking Cat that so much time and effort is devoted to telling innocent law-abiding motorists what to do and what not to do. 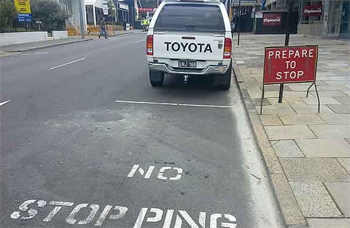 Of course there are so many signs telling motorists what to do and what not to do that they seem to cancel each other out um… as this picture shows. 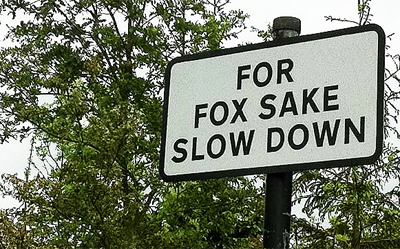 For Fox Sake Slow Down! Mind you in this instance I think that the ‘Fox’ on the sign could be the bushy tailed variety, still mark my words when the sign is ignored the ‘F’ word will appear. In the UK (and don’t tell the Brits but also in most of the rest of europe) the black and white sign on the left of the road in the picture below means that ‘no speed limit’ is in force. However the sign painted on the road means that the speed limit is strictly 30 miles per hour! I don’t think that this clever Cat needs to make much in the way of a comment on the overbearing bureaucratic nonsense that rules in the UK! Mmh Cat or Baby – Would You Change Your Baby For A Cat? Sometimes humans completely and utterly confuse me with the things that they do and worse things that they think. Then when they then go on to create a sign to describe what they are doing or thinking they probably confuse themselves. 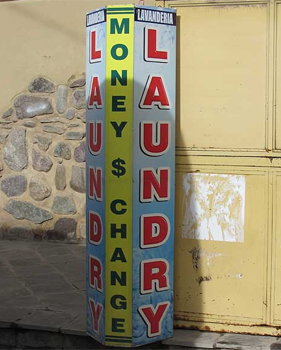 What is this sign all about – answers in a post to my wonderful blog appreciated. The funny thing about humans and the signs that they create is that they very often make absolutely no sense whatsoever. 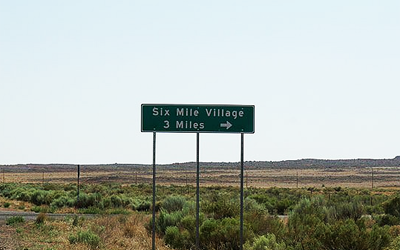 I would like to know exactly what was in the mind of the fool who named this village, the people who decided to put the sign where they put it and so much more, but I’m afraid that if I learned that I would just end up being as daft as the rest of you humans.